Here's how you get to Zurich. And once you are here, how to get around. In the city we recommend public transport, even for car enthusiasts: it's safe, reliable and gets you everywhere within no time - without having to worry about traffic jams and parking slots. Zurich International Airport (ZRH) lies 13 kilometres north of the city centre in the municipality of Kloten and handles around 700 flights a day going to over 170 destinations worldwide. You can find ATM's and information desks at Arrival 1 and Arrival 2 just after you pass customs. 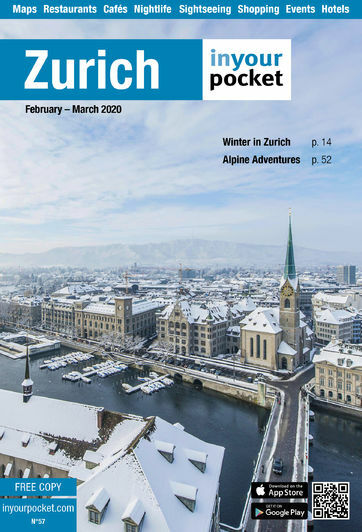 Find free copies of Zurich In Your Pocket at the information desk at Arrival1. The Airport Service Centre is located on the access to Parking 2 on the first floor (watch for signs) offering service and information (hotel bookings, bike rental, showers, baggage room...). It‘s open from 06:00 - 23:30. There is a big public shopping area with most shops open from 08:00 - 21:00 (groceries from 06:00 - 23:00). There is also Wi-fi, giving you free access to the internet for 120 minutes. Connect your laptop or mobile to the network 'ZurichAirport' and open the browser on your device. To get to town: The easiest and fastest way to get to and from the airport is by train. Take one of the fast trains or slower S-trains leaving from the underground railway station near terminals 1 and 2 - if the sign on the platform reads Zürich HB (HB = Hauptbahnhof = main train station), it‘s the right train. Up to ten trains leave an hour and the journey takes roughly ten minutes. Tickets can be bought at the ticket machines (switch them to English on the first screen) next to the stairs down to the platforms or at the counters. A ticket for an adult is 6.80Sfr and valid for one hour in the whole city (3 zones). If you plan to travel by public transport, make it a 24 hour ticket for just twice the price, or consider buying a ZürichCARD (free transport and free entry to museums). A taxi ride to central Zurich costs around 60Sfr. Taxi stands are just outside Arrivals 1 and 2. Only licensed taxis are allowed to pick up passengers. They are generally safe and reliable. Tram N°10 takes you from the airport via Oerlikon to Zurich main station as well. The journey takes 37 minutes, same tickets as for the trains are valid. Good option if your hotel is in Zurich North. Zurich‘s main train station, referred to by locals as HB (Hauptbahnhof), is right in the centre of the city. Zurich‘s major shopping mile Bahnhofstrasse starts just outside. All international and domestic trains leave and arrive here. From the platforms just follow the herd towards the main hall, where you will find ticket offices and the Tourist Information. Trams, buses and taxis leave just outside the station. From the main station trains to all major Swiss cities leave once or twice an hour. Several direct trains a day leave here for many European destinations, such as Milan (4hrs), Paris (4.5hrs), Munich (4hrs), Berlin (8hrs) or Vienna (9hrs). At the ticket office in the main hall you can buy train tickets, tickets for public transport in Zurich (available as well on the many ticket machines) and also change money. You must pay a fee to use the toilets (McClean), where you can also shower. SBB by the way is the abbreviation for the major Swiss national railway company, and becomes CFF or FFS in French or Italian respectively. Fro time tables and ticket you can also refer to www.sbb.ch, call (+41) 900 300 300 (1.19Sfr/min) or download the free app 'SBB Mobile' to your smartphone. The train station can compete with any shopping centre, with a range of mostly subterranean shops, restaurants, a gym, a medical centre etc. They are all open from 09:00 - 21:00 on weekdays and 09:00 - 20:00 on weekends (some shops have longer opening hours). On Sundays shops in railway stations and petrol stations are the only ones allowed to be open. International buses as well as sightseeing coaches arrive and depart from the bus station (Bus Terminal Sihlquai, F‑10), a two-minute walk north of the main train station. Finally there are also domestic inter-city buses in Switzerland, which began operating (by Eurobus) this summer. See www.swiss-express.ch. The Swiss highways A1, A2, A3 and A4 lead from all directions to Zurich and if you follow the signs to Zurich City the city centre is quite easy to reach. But parking in the centre is scarce and very expensive. Car parks and hotels charge up to 40Sfr for 24hours and you can hardly find parking spaces where you can leave your car for more than 90 minutes. Nevertheless we recommend you stow away your car in a car park and use the excellent public transport system. For overnight parking you can try to find a slot in the so-called blue zone in residential areas - parking there is free from 19:00 - 08:00, but you need to indicate your arrival on your parking disk. Driving in Switzerland is generally easy, as roads are in good condition, sign posting is excellent and drivers usually not aggressive. If you‘re using the motorways you will have to buy a vignette for 40Sfr (available in petrol stations and post offices, valid one calendar year) to stick on your windscreen. When driving in Zurich remember that trams always have right of way, as well as pedestrians on all zebra-crossings without traffic lights. Headlights must be turned on all the time. The legal alcohol limit for drivers is 0.05% as in most other European countries, which should allow you roughly to have one glass of beer before driving. The standard speed limit is 50km/h in urban areas, 80km/h outside towns and 120 km/h on motorways. In residential zones in Zurich, the speed limit is often 30 km/h. We strongly advise you to observe the limits carefully as there are dozens of fixed and temporary radar controls in the city. Fines are high and yes, Switzerland has agreements with many European countries to make sure you pay the fine even if you have a foreign number plate. You may use your home driving license in Switzerland as long as it is valid - if the license is a non EU-one and in a language other than French, English, Italian or German it is recommended that it be accompanied by an international one.